Plyometric boxes can be found in most, if not all gyms. They can be used for a wide variety of exercises, but one of the most favoured, is the box jump; the exercise where people pile the boxes on top of one another and jump as high as they can, sometimes seemingly with little consideration to technique. The question is, is higher better? And does technique really matter when all you’re trying to do is jump? Plyometric training is a popular technique which aims to improve the stretch-shortening cycle, muscular strength, joint stability and overall force production. The stretch-shortening cycle explains the action of a muscle producing energy by eccentrically contracting (lengthening) and then the same muscle immediately concentrically contracting (shortening) to produce an explosive movement. Box jumps are a great exercise to train this mechanism and improve lower limb power. They also decrease the stresses of landing on the joints by jumping onto an elevated surface; this is because gravity has less time to build momentum and thus, landing forces are reduced. Although, it may seem that the bigger the box, the better, this is not necessarily the case. 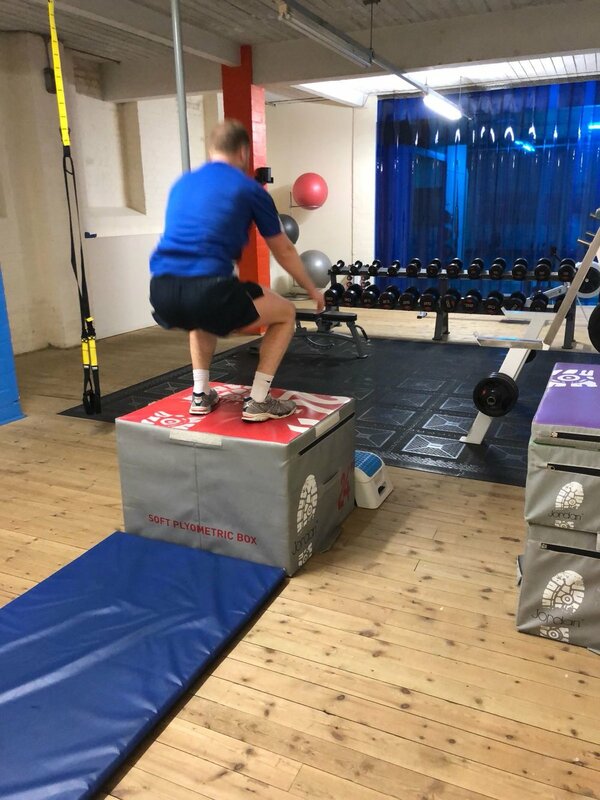 There are a number of factors to take into consideration; such as individual biomechanics, technique and the rationale for using box jumps are a method of training. How high you can jump, does not depend on the height of the box. It is about your ability to overcome downward forces, such as gravity, to rapidly move your centre of mass away from the ground to the highest possible point. Biomechanically, a taller person has a higher centre of mass, therefore, less force production is needed to achieve their optimal centre of mass. Think of a taller person jumping onto a 30” box compared to a shorter person with a lower centre of mass. Jump height may be absolute, but the ability to achieve the jump is relative to individual mechanisms. If jumping onto a higher box results in poor landing mechanics, you are likely to do more harm than good. Poor landing technique does not translate to real life or real world sporting situations without increasing the risk of injury. If you need to pull your knees up towards your chest (as you would in a tuck jump) to prevent your feet hitting the edge of the box, you are likely to find yourself collapsing forwards once contact has been made with the box. This is not effective training. Instead, you’re training poor posture and forceful deep hip flexion. Correct technique is essential when box jumping to achieve the best results, whilst minimising injury risks. The technical model of the box jump requires full extension of the arms to be drawn behind the body and the hip, knee and ankle to triple flex into a half-squat position. The execution phase of the jump requires full extension of the arms overhead, swinging through an arc-motion in front of the body to assist with triple extension of the hip, knee and ankle allowing for a stiff body posture during take-off. When clearing the box, ready for landing, legs should remain relatively straight and stiff, until slightly bending at the knees and hips to land, absorbing the external forces. The finished position should be a quarter-squat, with a stiff leg position to achieve an athletic stance that is reflective of the optimal stance within sporting activites and every-day functional movements. Maintaining a braced core, the chest should be open and shoulders back, for an upright posture to position the centre of mass in line with the body rather than in front of the body which is often the case when you fall forward, out of the jump. It is important to note not to jump backwards off the box, as this places unnecessary stress on the Achilles, knees and hips. Drop jumps are also an essential exercise to train force production and optimise landing mechanics. Stepping off the box with a straight leg and toes in a neutral/slightly dorsiflexed position, elastic energy is generated within the achillies tendon to transition into the contraction phase following the subsequent take-off from the floor, assessing your ability to generate force over a short period of time with limit eccentric contraction of the muscles. The take-home: Box jumping higher does not always mean better. Whilst jumping as high as you can, to your limits is definitely fun – and everyone should enjoy their training – it is not the most effective training method. However, as a tool to evaluate how effective your training has been, we definitely recommend periodically testing out how high you can jump, but BE SAFE! Box jump exercise - Yas comments that her ankles require more dorsiflexion.